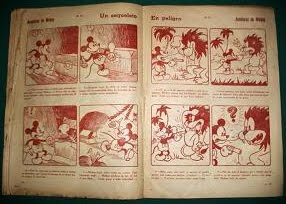 A very rare sample from a very little-known (unknown to me till now) pre-war Chiliean Disney magazine has surfaced on ebay. The no. 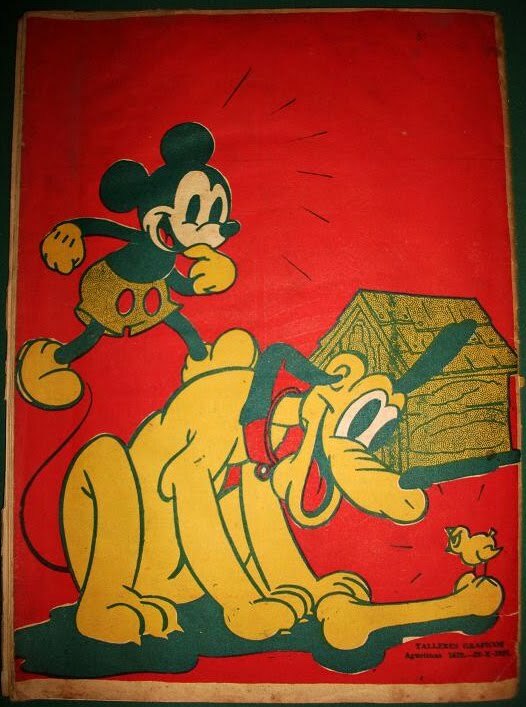 19 of Album Mickey, reportedly put out by a publisher named Ercille in 1937, is currently being offered by an Argentine-based seller for 750 US dlrs.The cover art is reproduced from the cover of Mickey Mouse in Giantland published by David McKay Co. in the US in 1934, which was an illustrated text story adaptation of the Mickey Mouse cartoon short Giant Land (1933). The ebay seller states that the item "features exclusive drawings by a local illustrator called Jorge Christie (considered the main pioneer in the local comic book industry), and supposedly also original stories." 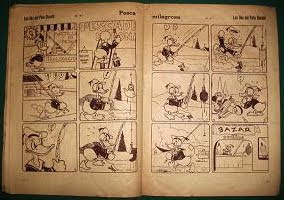 Judging by the images provided by the seller, the sparse comics content of the magazine, which seems to be modeled on the Mickey Mouse Magazine from the US, largely consists of one or two page gag comics, some of which are non-Disneyic such as Popeye and Felix the Cat, plus a four-page extract from the first Mickey Mouse daily newspaper continuity from 1930: However, some of the other gag comics might indeed be of local origin, such as this Donald Duck gag which definitely does not originate from any of the Sunday newspaper comics featuring Donald Duck; unless it originates from the Mickey Mouse Magazine, it is likely to be a local (Chilean) production. 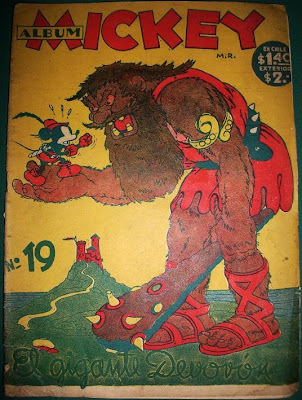 The same applies to the below Goofy gag, but one should also add the British Mickey Mouse annuals (which often used a three-panel-per-page format) as a possible source in this case: The back cover is reproduced, with minor alterations, from the front cover of no. 20 (dated May 1937) of Mickey Mouse Magazine: Album Mickey, whose first issue had come out on June 18th, 1937, lasted till no. 40 (March 18th, 1938).